We measured a selection of these jackets and also tried them on our Fit Check mannequins Huey and Dewey to see how they fit (Huey is in a Euro 52 and Dewey is in a 56) and they both look great. The overall fit is largely consistent with other European sized jacket we sell such as Alpinestars and REVIT, but the fit is trim. This product is sold in European sizes. Generally speaking, the US chest size in inches is equivalent to roughly 10-12 points less than the European jacket size. Example: a 56 Euro jacket is similar to a size 44-46/XL men’s US size. To choose a size in this jacket, I’d suggest you measure yourself with a tape and get your chest size and belly size, then use the size chart to pick the smallest size jacket that will be big enough for both your chest and belly using the chart below. Approximate US alpha sizes are also listed in the chart so you can check if the jacket size you choose is the same alpha size as you normally wear in men’s clothing. The overall cut of this particular style jacket is what I’d call “classic”. If you follow the chart you’ll get a trim fit which is typical for motorcycle appeal. If you want a more relaxed fit for more comfort for casual wear, then choose one size larger than indicated in the chart. Its more of a “street cut” so it will be an easy fit for most and comfortable to wear. The only thing I thought I should mention is that the sleeves are fairly trim, so those with average arm bulk or skinnier types will do fine with this style, but if you are bulky in the arms, then this jacket probably wouldn’t be a fit. Here’s a closeout we just couldn’t pass up. Who doesn’t want a classic leather jacket style like this either for use on your bike or even casual wear. Dianese has made several “retro” styled jackets like this in recent years which are really sharp, and when we saw this one available for a closeout price, we jumped on them! The HF-D1 comes in both a solid leather or perforated leather design. The solid one is sold on this product page… take the link below to view the perforated version. There is a visual difference of course, but functionally, the perforated jacket with breathe a bit better for warmer weather use and the solid jacket will be better for cooler/cold weather since the solid leather will block air flow and allow your undergarments to keep you warmer. If you are considering the perf version, be sure have a look at the close-up pictures… the perforations are done on a precise pattern leaving the edges of each leather panel solid. I guess they cut the pattern and then perfed the holes specific to each cut piece. Most people wouldn’t have much appreciation for this, but I think it is sharp and I would imagine the stitching of solid leather is stronger than stitching through perfed leather. I just thought is was worth a mention as being an indication of the overall quality of these jackets. But anyway, your expected temperature conditions should probably be the main decider. Both versions have a sturdy, but plain cotton liner inside. The liner holds the armor for the shoulders and elbows, which is the Pro-Armor type. There is a pocket for the addition of a back protector too, and I’ve listed those below. The Pro-Armor G choice would be the the one that matches the type of elbows/shoulder armor, but any of the three styles will work. 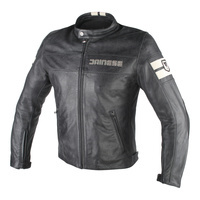 Dainese says: Dainese delved into its legendary archives for the HF D1, which is a faithful replica of a classic leather jacket, produced in exquisite refined full-grain vintage leather with a cotton liner. CE -certified removable Pro-Armor soft protectors are provided at the shoulders and elbows.